VT-6TSBM Features: -Attractive and freestanding. -Thermoelectric cooling technology. -Mirrored trim. -Sturdy pull-out black wire shelves. -Interior light. -Temperature range: 46° - 65°F. Finish: -Black and mirrored. Cooling System: -Thermoelectric. Defrost System: -Automatic/Frost Free. Temperature Display Type: -Touchscreen. Interior Light: -Yes. Temperature Zone: -Single zone. Wine Bottle Capacity: -6. Door Glass Type: -Double pane. Dimensions: Overall Height - Top to Bottom: -19.5". Overall Width - Side to Side: -17.8". Overall Depth - Front to Back: -9.7". Overall Product Weight: -17 lbs. 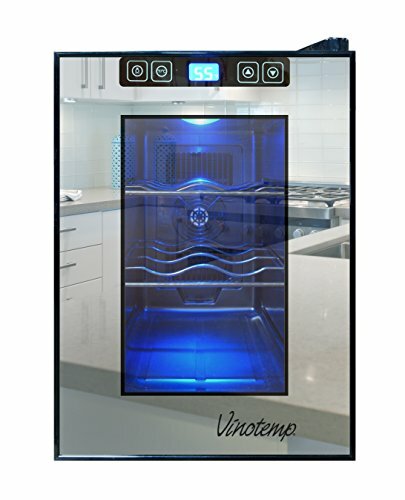 Vinotemp VT-6TEDS Thermo Electric Digital Black w/Stainless Steel trim (6) Bottle wine chiller. 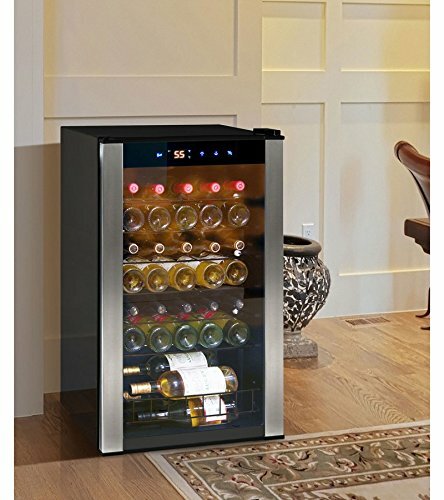 This is our most compact table top wine cooler which stores 6 bottles of your favorite wine at just the right temperature. 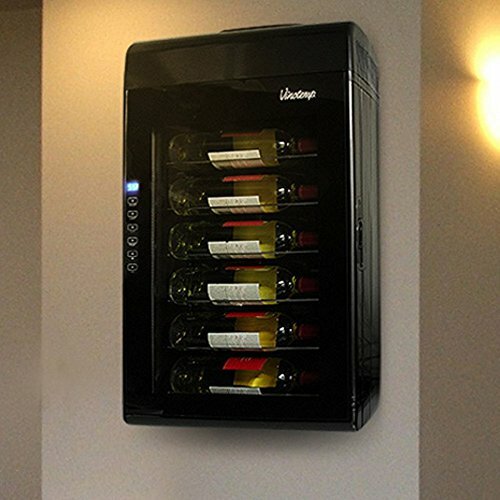 With the innovative thermo-electric cooling system, which involves very few moving parts, your wine will be protected from unneccessary vibration. More importantly, Thermo-electric cooling does not use ozone depleating chemicals such as CFC's or HCFC's so you will be sure that you are doing your part to preserve the environment. For increased enery efficiency, the VT-6 uses dual paned glass windows, a technology that has been proven in the construction industry. They have better insulation properties and better UV protection providing energy efficiency which will lead to less electricity usage and savings. Featuring a black cabinet with stainless steel door trim and handle and sturdy wire shelf racking for individual bottle storage. 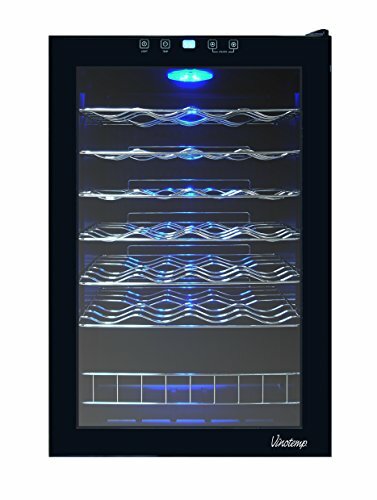 Vinotemp VT-28TEDS Thermo Electric Digital Stainless Steel (28) Bottle wine cooler. 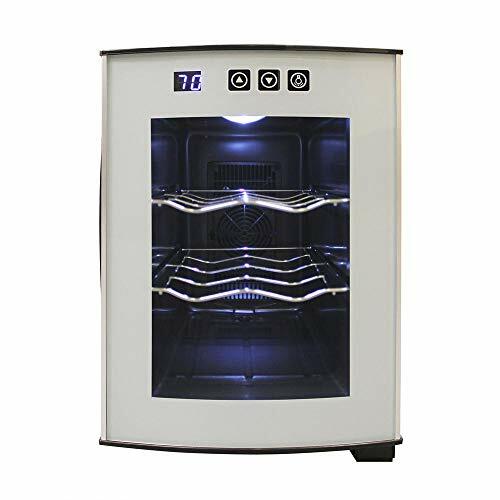 Attractive free-standing cellar with double paned glass door and stainless steel trim Thermoelectric temperature control for ultra-quiet and energy efficient operation. Sturdy shelf racking for individual bottle storage. Looking for a fun and stylish way to display your wine? 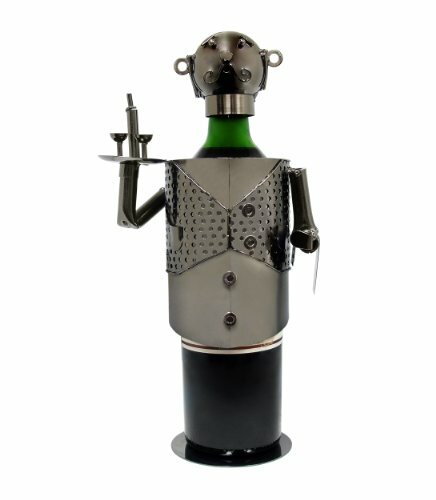 The Waiter Wine Bottle Cover is the perfect party pleaser as he instantly brings life into any setting. Fitting all of your favorite Burgundy and Bordeaux bottles and made from quality brushed metal, this friendly cover is the ideal kitchen companion or extra guest at your next gathering! Features: The Waiter Wine Bottle Cover is a chic addition to your favorite bottle. This cover is constructed to last, made of quality and stylish brushed metal. The bottle cover fits standard Burgundy and Bordeaux wine bottles. 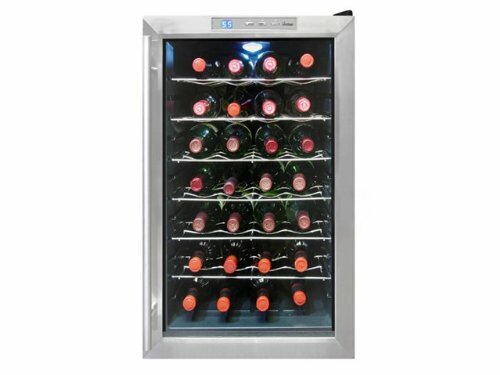 Store your favorite bottles of wine in the 34-Bottle Wine Cellar from Vinotemp and maintain optimum temperature for your wine collection. This sleek and sophisticated cooler makes for a perfect addition to any space. 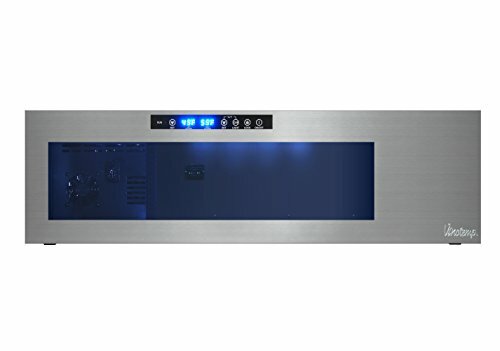 Easily adjust the temperature with a touchscreen control panel and LED display. Display your wine bottles on sturdy wire shelves and bulk storage section. Leek wall mount design lets you keep bottles at hand without the unit taking up counter or floor space. It's attractive too, with its clear glass door and soft interior illumination. The eco-friendly thermoelectric cooling unit is whisper quiet, controlled by an easy-to-use touch-screen temperature control with digital display. Wine cooling was never so cool. 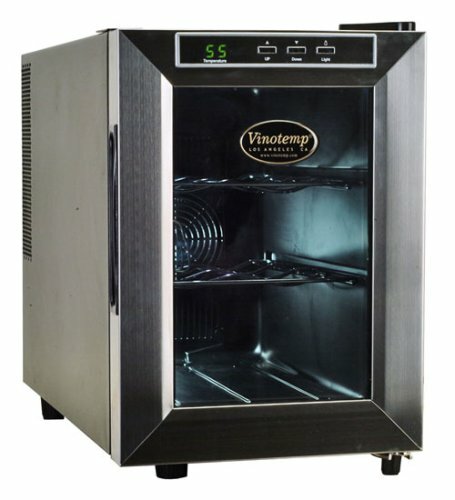 Looking for more Vinotemp 6 Bottle similar ideas? Try to explore these searches: Created Moissanite Enhancer, Sterling Silver Tibetan Spin Ring, and Brushed Nickel Plug. Look at latest related video about Vinotemp 6 Bottle. Shopwizion.com is the smartest way for online shopping: compare prices of leading online shops for best deals around the web. Don't miss TOP Vinotemp 6 Bottle deals, updated daily.